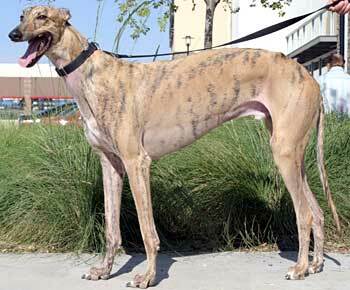 Ritz, aka Jaffa Peter, is an 8-year-old light brindle male, born on April 29, 2005. Ritz's sire is Be Discrete and his dam is San Tan Cake. 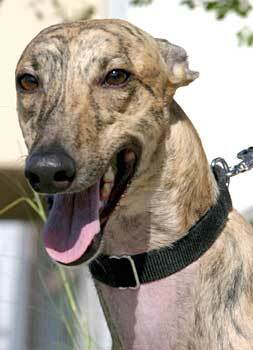 Ritz came to GALT with a previously injured left rear knee; the knee was damaged during schooling nearly 6 months prior to us receiving him and had pretty much welded together. Unfortunately Ritz accidentally suffered a very severe injury to his front left leg on December 17, 2006, due to an unknown cause. He was taken to an emergency clinic, where he was treated and released. Ritz had a long road to recovery. He was in a home for five years, but returned to GALT due to these unhappy economic times. 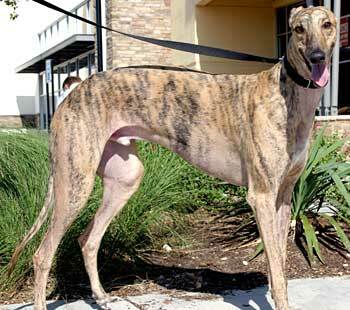 Ritz was adopted out again for five months, but has returned to GALT once more due to absolutely no fault of his own. These are Ritz's original pictures - updated pictures coming soon. Ritz is a strikingly beautiful boy. He is tall and very streamlined. Always happy, his tail is constantly wagging from the minute he wakes up. He is extremely affectionate, loves attention, and not just from his foster family. Ritz loves attention from EVERYBODY. He loves to be rubbed, scrubbed, and kissed. It doesn't matter if it's a stranger that approaches him or his canine siblings, he gets along well with all. He does wonderful with older kids, the more the merrier, as Ritz is sure they all are his visitors. Ritz is a bit too friendly with cats, but does fine with small dogs. In spite of his past injury, Ritz loves to run outside in the yard chasing tennis balls. He doesn't actually have the retrieving part down - we're leaving that to the labradors, but Ritz is happy to run after balls and then proudly walks around displaying them in his mouth. Toys are his buddies and he transports them to wherever he is headed and even takes them to sleep with him. He has one special red heart-shaped pillow that he loves and gently holds it in his mouth. Other soft stuffies beware - Ritz will tear you apart and distribute your insides all over the house. Ritz is moderately active. He waits with anticipation for his walks. He loves to travel in the car and has a "places to go, people to see" attitude. Ritz is house trained and has never had an accident in our home. He sleeps quietly through the night on his dog bed in our bedroom and rises only when he hears us get up, so if you like sleeping in a bit, Ritz is the perfect companion for lazy Saturday mornings. Ritz is crate trained and doesn't mind being crated for short periods. For longer periods, he prefers just to wear his greyhound muzzle. He eats 4 cups of Eukanuba Low Residue, twice a day in his crate and roos to announce that he is finished and ready to continue his day.